The time for DRASTIK has come! This day and age proves to be drastic times indeed. Our DRASTIK Folder will do you proud with its substantial gladius style blade inspired by 3rd century B.C. Roman swords. An EDC that can stand up to hard use is on everyone’s must have list. This knife, with its black frame and blade, accented with blue touches, exudes confidence and culture. DRASTIK is complete with the 5-Ways of Opening system, the ergonomic thumb wedge and substantial coffin style frame. This is a must have for any enthusiast or someone looking for a daily use tool. I just got mine in on 11/13/18. I just wanted to say how beautiful this knife is. I love the false edge, it gives the appearance of a dagger. 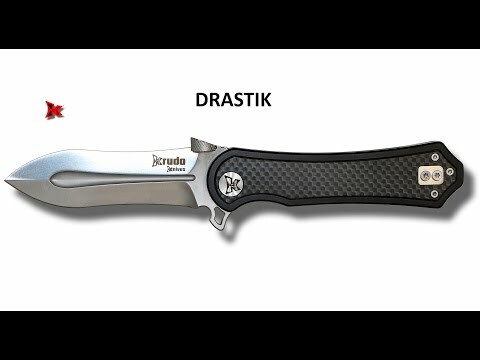 The function of the Drastik is awesome! Really the only way I can describe this knife is just Beautiful!! I was going to carry it, but I love it so much I’m going to collect it. I just might have to buy a second one just so I can carry it! This knife wont disappoint. Thank You!